This post is sponsored by SheSpeaks, Inc. and Just Born, Inc. All opinions are mine alone. I love creating with Marshmallow PEEPS! Sometimes I bake with them, but most often I love to craft with them. This year I made a Marshmallow PEEPS Christmas Centerpiece. 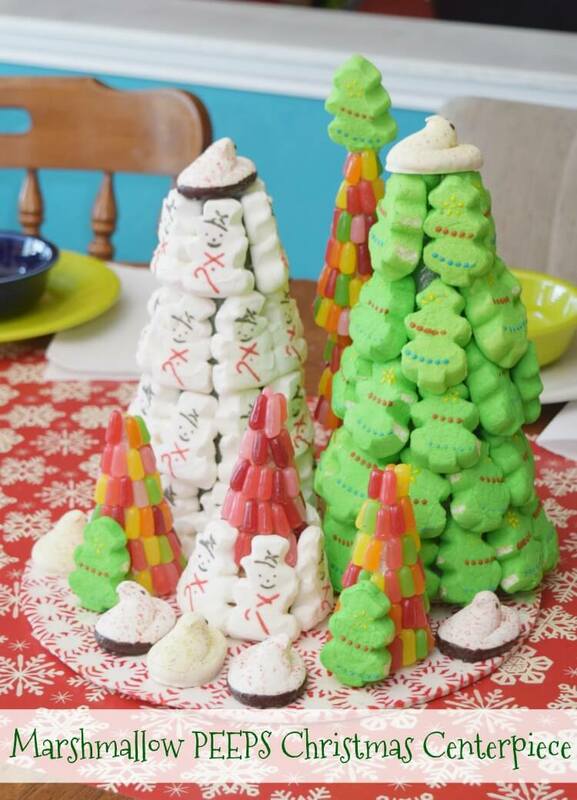 It’s full of Marshmallow PEEPS trees and MIKE AND IKE candy Christmas trees all topped on a peppermint platter. 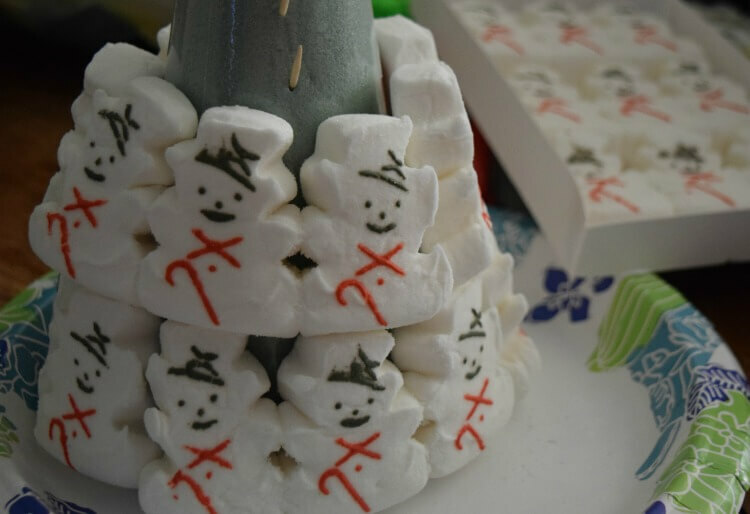 These are incredibly simple to make, and your kids can definitely help out with the Marshmallow PEEPS trees. 1. I recommend the “dry foam” styrofoam cones as they are easier to push the toothpicks in over the regular styrofoam ones. 2. 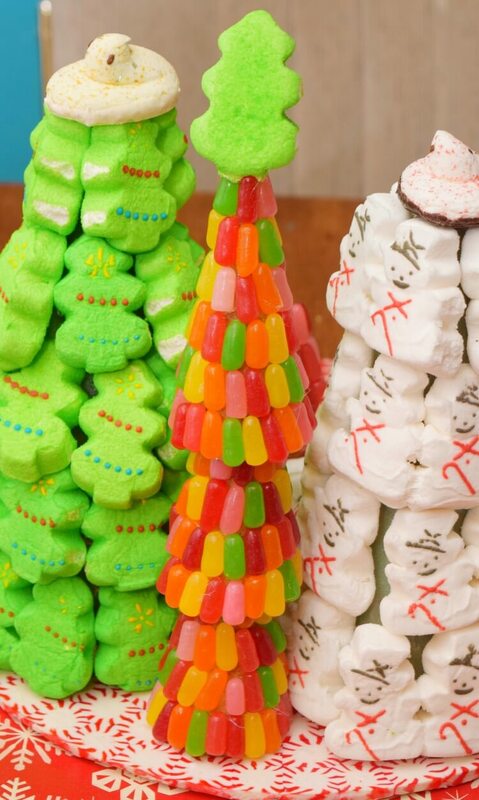 You’ll need 2 toothpicks for 1 PEEPS Marshmallow Tree — one for top of tree and one for bottom. Just begin pushing in the toothpicks around the base enough so that they don’t stick out of the Marshmallow PEEPS. Then, begin pushing the Marshmallow PEEPS on to the toothpicks. This takes some trial and error, but once you figure it out, you’ll quickly make row after row until you work your way all the way to the top. 3. 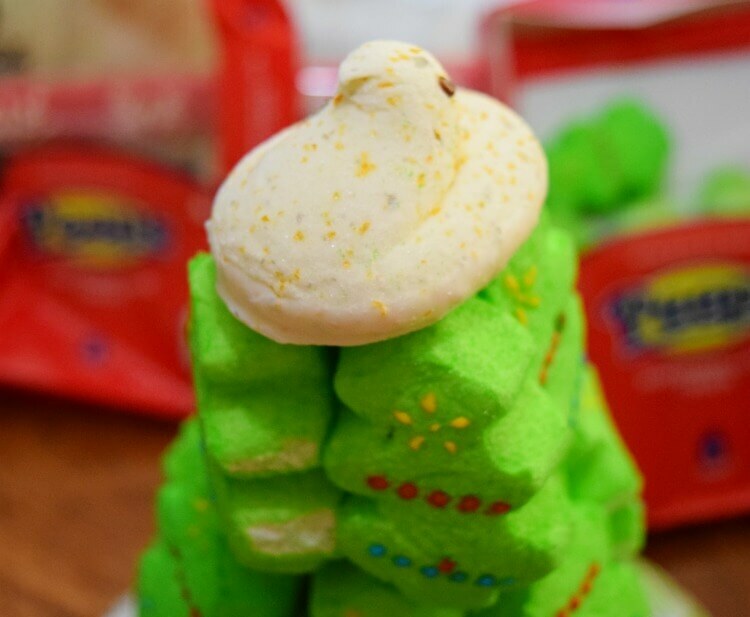 At the top, I only had a small part of the cone sticking out, so I inserted toothpicks at a deep slant and pushed a single PEEPS Marshmallow tree or PEEPS Marshmallow snowman onto each toothpick. 4. Lastly, add one toothpick to the very top of the cone and slide a PEEPS Delights onto it. 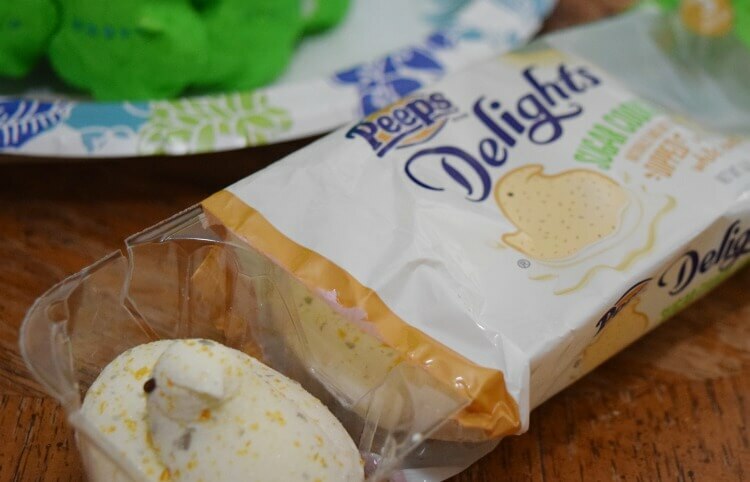 I found that the PEEPS Delights Sugar Cookie looked best with the PEEPS Marshmallow trees and the PEEPS Delights Peppermint Bark looked best with the PEEPS Marshmallow snowmen. 5. If you’re making this ahead of time, only do so about 1-2 days early. 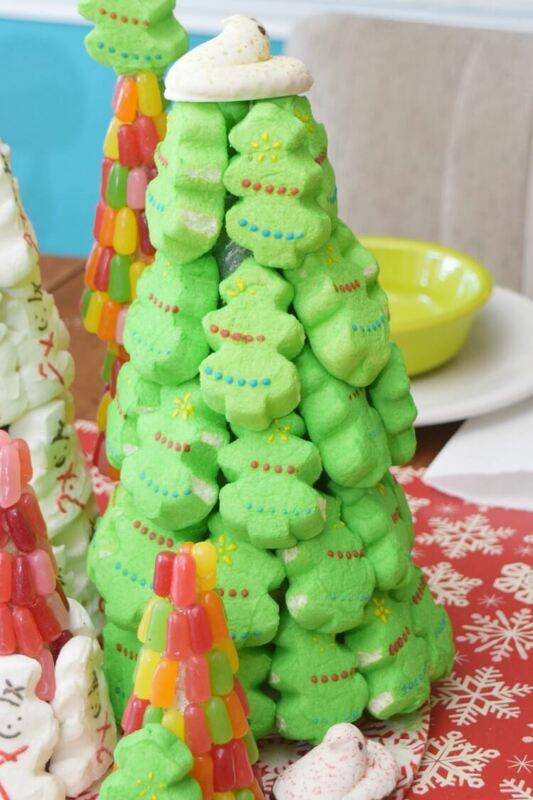 I used a trash bag and gently placed it over the top of the Marshmallow PEEPS Christmas Trees until I was finished with the entire centerpiece. 1. 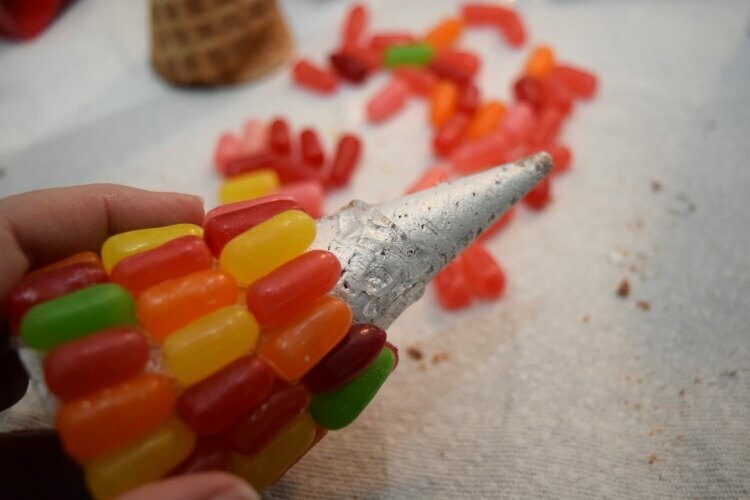 Turn the sugar cone upside down and begin attaching rows of MikeandIke candies with the hot glue gun. 2. I tried to vary the colors of the candies. 3. 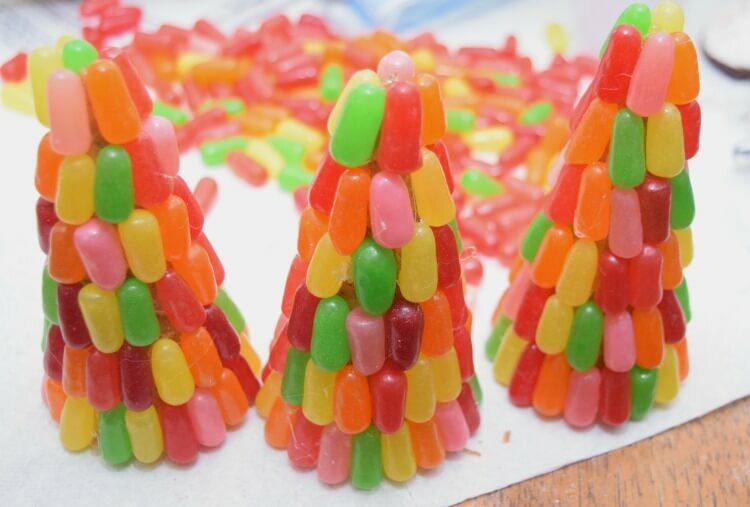 I also found stacking 3 MIKE AND IKE Christmas trees and hot gluing them together made a great tall tree to go with the Marshmallow PEEPS Christmas Trees. Once I created all the trees, I also created a huge peppermint platter for the centerpiece. Then, I added extra Marshmallow PEEPS and PEEPS Delights all around the platter. It came together so easily, and it’s just perfect for a Christmas party table full of food! 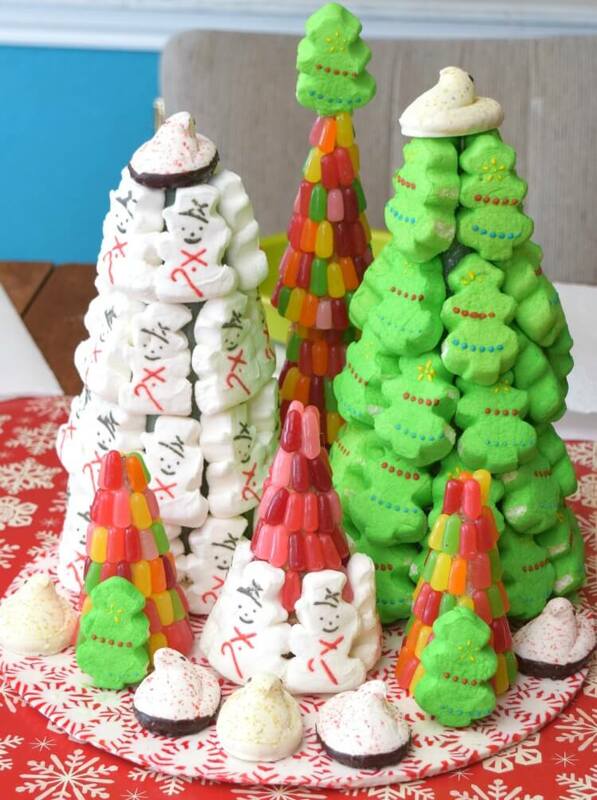 Marshmallow PEEPS also has great flavors for the holidays! 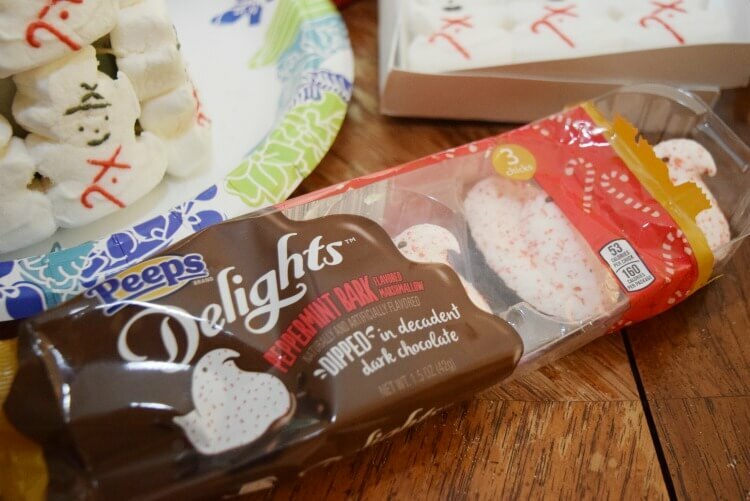 With their PEEPS Delights you can find Peppermint Bark, Sugar Cookie, Hot Chocolate, and Cinnamon Roll flavors! Plus, make sure to also look for Chocolate Mousse Marshmallow Reindeer and Gingerbread flavored Marshmallow Gingerbread Men! 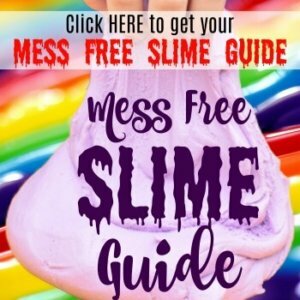 Need more great ideas for your PEEPS? 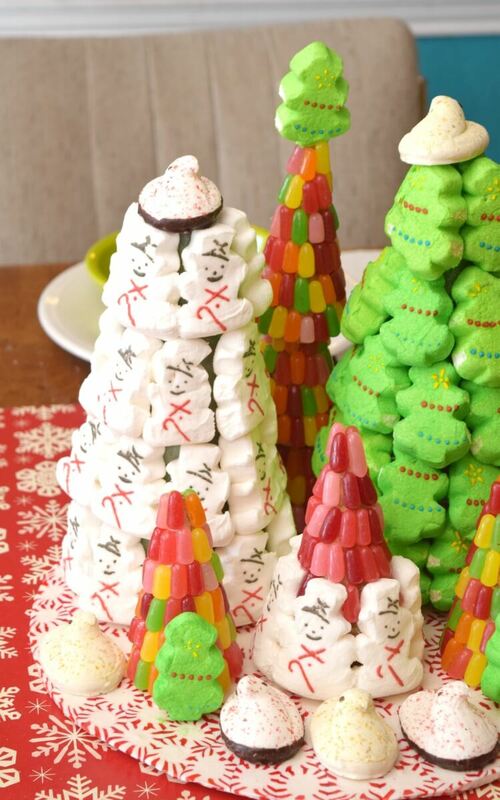 Visit MarshmallowPeeps.com and PEEPS on Facebook and Instagram to get inspiration and have a PEEPS overload of cool recipes and delicious ideas for this Holiday season! That looks like it would be so fun to make! 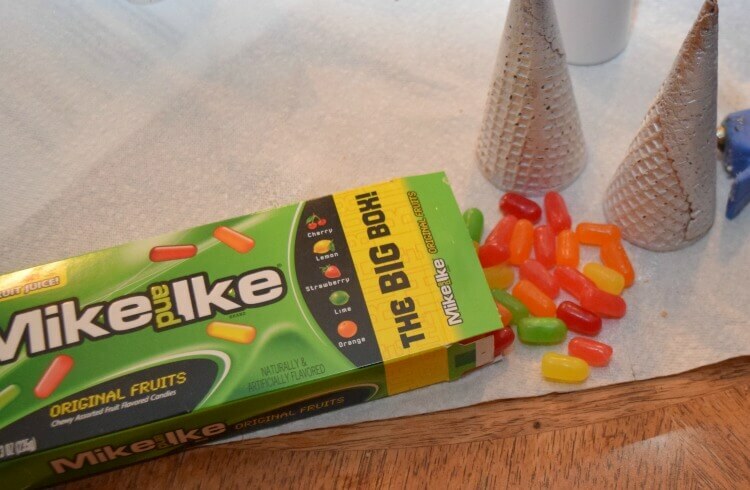 I especially love the Mike & Ike tree with the Peeps at the bottom. So cute! Wow this is such a great idea! I would have never thought of this. They make such a wonderful Christmas decor piece too! These have to be the cutest center pieces ever! They also look super yummy. I wish I could find peeps like that here. My kids would love this. These are such cute ideas for Christmas centrepieces! We are having our Christmas lunch tomorrow (early as we are away at Christmas_ so I might see if I can find something like these here in Aus! I personally LOVE Peeps! I know they get a bit of negativity, but, that’s just more for me! I love your creations! what a fun activity to do as a family! I think I could accomplish this and it might look half as good as yours. Okay these are the cutest little things! I know my kids would love to help make these and of course devouring them as well! I feel like these would be the perfect centerpiece at a kid’s table or a cookie decorating party! My kids love peeps! Your Peeps trees turned out so cute! I think my church has some kind of Easter contest every year where they make Peeps houses and the best house wins. It would be fun to have a Christmas Peeps contest too! This is the cutest! PEEPS have always been my absolute favorite during Easter and I love that they are now out for all the holidays! This would be so much fun for our elf to leave one morning! What a fun idea! My kids would love doing something like this. They love everything to do with marshmallows! I didn’t know they made Christmas peeps. Thought they were only for Easter. This peeps centerpieces are so fun and festive. It looks like a whimsical little wonderland. I am not a big Peeps fan personally, however I have some kiddos that would absolutely LOVE this idea! Don’t know how long these centerpieces would last at a holiday party. the first few guests would eat them. they look delicious! what a lovely and fun idea to do with kids! I am not a marshmallow fan, but they are and so is my husband, so this is perfect! Blessings! These look like something my kids would love to help make. I need to go find some peeps when I go to the store.